Hi, Thank you, friends and viewers. 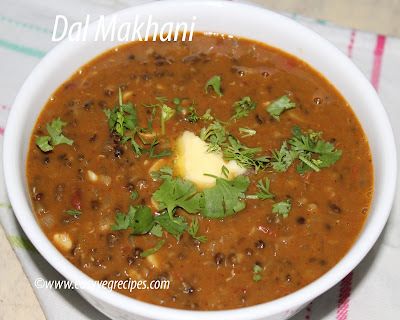 Today I will post how to make dal makhani recipe. Dal makhani is another North Indian recipe, easily available in restaurants. One of my most favourite North Indian dish. This dish is protein and calorie rich. The buttery taste and spices added in it gives a rich taste. I kept it for two days and enjoyed to the brim. We use whole urad in this recipe we call it minumulu in Telugu. Dal MakhaniProtein rich side dish for roti. Soak whole urad dal and rajma for 8 hours. Chop onion, tomato, ginger and garlic. Add half portion of chopped ginger,garlic to the soaked urad dal and rajma. Pressure cook for five to six whistles. Or cook till rajma become soft when pressed. It needed 6 whistles to cook rajma softly. Drain excess water and keep it further usage. In a thick bottomed vessel, heat butter. Add cumin seeds and let them splutter. Add choppped ginger and garlic. Saute them for a minute. Add chopped onions and fry till they turn light brown and translucent. Add chopped tomatoes and fry till they turn mushy. Add turmeric powder, salt, red chilli powder and garam masala. Add cooked dal with water and cook till the aroma comes out. Cook dal makhani on low to medium flame for 15 to 20 minutes. Once the desired consistency reached, add fresh cream to it and switch off the flame. Serve hot smoky dal makhani with plain kulcha, roti or naan.